They just can't help themselves. Turn on Fox News this week and all you hear the right wing talk about is ACORN, ACORN, ACORN. On Tuesday, right-wing nutjob Representative Michelle Bachmann accused ACORN of getting billions of dollars in stimulus money to carry out voter fraud. She knows it's a lie -- but these guys just really can't stop. They're so scared of ACORN they're willing to try every lie in the book. But here's the thing: ACORN isn't getting billions from the government -- far, far from it. And fighting these daily attacks? It ain't cheap. ACORN operates on a shoestring. I know, I've been to their crowded offices. I can tell you firsthand that this isn't some fat cat big money non-profit with deep pockets. Everything they are, everything they do is because of small donations from regular folks. If you believe in progressive ideals -- if you believe in communities bettering themselves -- if you believe that every one of us ought to do what we can for each other, especially during hard times -- Then, join me and contribute $35, $50, $100 or whatever you can afford right now to one of the only groups I know of that is working in the neighborhoods hardest hit by years of Republican crap. ACORN is out there working in the neighborhoods every single day. They are the community organizers who are doing all they can to help working people stay in their homes, raise their kids, improve their environment and their schools. Right-wingers like Michelle Bachmann think they can get away with picking on those who can't stand up for themselves. 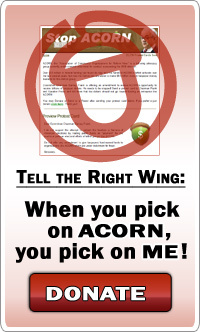 It's time for the rest of us to take a stand, and to put our money where our (big) mouths are: When you pick on ACORN, you pick on ME! Thousands of you have already stood shoulder to shoulder with ACORN members across the country and sent a message to Michael Steele, Bill O'Reilly and the entire right wing bunch. Now, let's give them something to really be scared about: You, me, and thousands of supporters contributing to support ACORN today. © 2009 ACORN and ACORN logo are Registered Trademarks of the Association of Community Organizations for Reform Now, Inc.